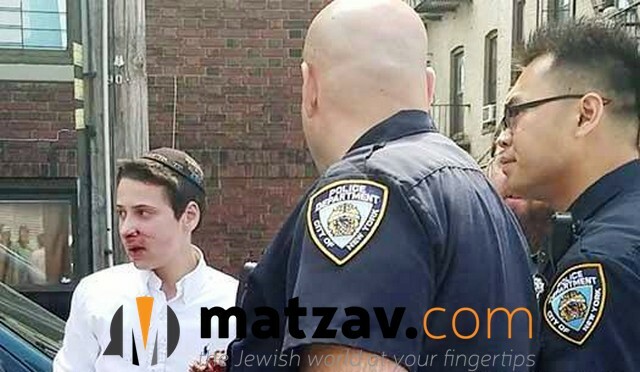 Brooklyn, NY – A group of young teenagers who were ‘playing hooky’ from a local public school walked past the Oholei Torah Mesivta Boys High School in Crown Heights and started an altercation with the students there, which escalated until one yeshiva student received multiple blows to the head. To make matters worse, police officers refused to take action and, as of this moment, have still not charged the assailant, citing fears of riots. 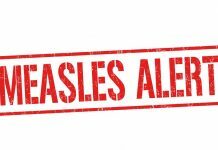 The incident occurred this morning, at around 10:15 a.m., in front of the Oholei Torah Mesivta Boys High School, located at 417 Troy Avenue. Just as the students were ending their morning break, a group of five young black teenagers – two boys and three girls – approached the students who were playing ball outside. At first the encounter was friendly, with one of the black teens high-fiving and shaking hands with the Jewish students, but the yeshiva students largely ignored them beyond that. In an apparent effort to draw some reaction from the students, one of the antagonists ‘fell over’ a bike that was chained to pole and another then intentionally stepped on it. 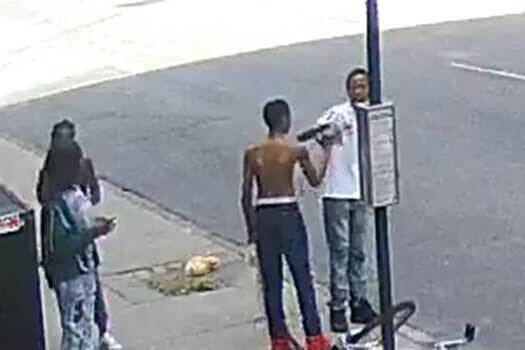 Approximately a minute later, the student whose bike was knocked over and stepped on confronted one of the black teens, who in turn spit in his face and then assumed a ‘fighting stance.’ The altercation quickly escalated to blows, with the Jewish student receiving eight punches to his face and head. 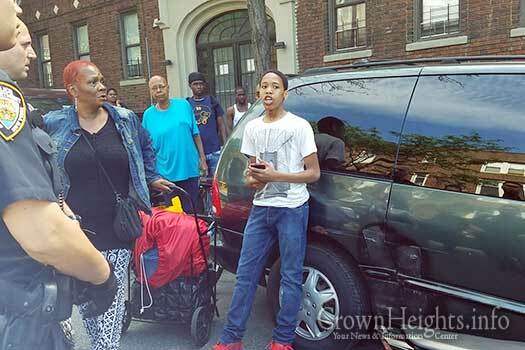 Though some punches were thrown in return, neither of the black teenagers was hit. The two assailants then high-fived and fist bumped each other as the school’s principal ushered all the students back into the school. The group then walked past the school pointing at and mocking their victims. 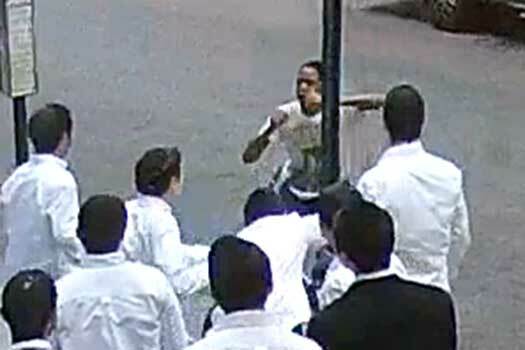 A moment later a school employee confronted the group, while witnesses notified police and Shomrim of the assault. Shomrim volunteers were the first to arrive on scene, just as the group scattered and fled. 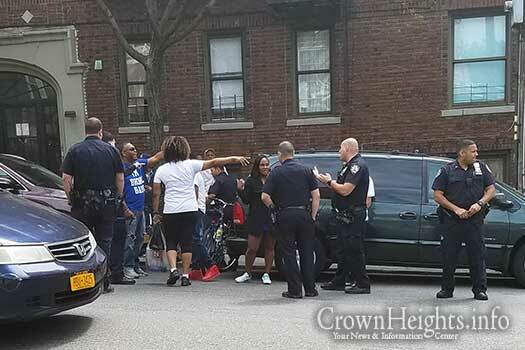 Bystanders, students and witnesses chased the main antagonist, who gave up running just a block away, on Montgomery Street near Schenectady Avenue. 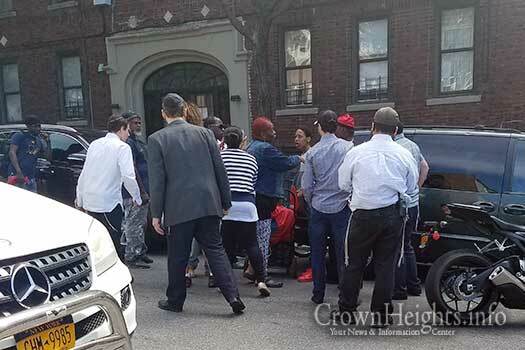 Again, police were called to the second scene – which was quickly turning volatile, with dozens of black residents coming out of their homes to the aid of the suspect and some espousing anti-Semitic rhetoric. 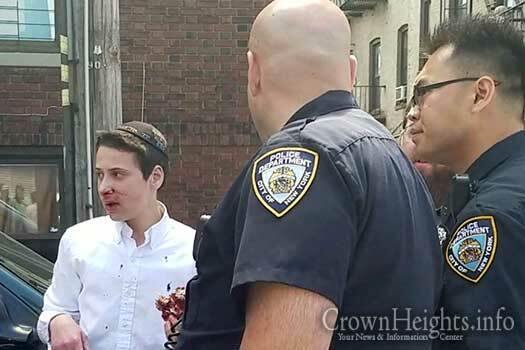 With his face all bloodied and bruised, the victim refused to back down and stood there waiting for police to come, while the gathering crowd shamed and belittled him. “What are you making such a big deal out of it? Get over it and go home,” said one man. By the time police officers showed up, a very large crowd gathered, but officers were reluctant to take any action, some citing the fear of riots while other officers saying that they need to conduct an investigation. Initially officers allowed the perpetrator to remain outside their custody, all while people were coaching him on what to say. “You don’t say nothing, you tell them they beat you up and stepped on you,” a woman was overheard telling the suspect. 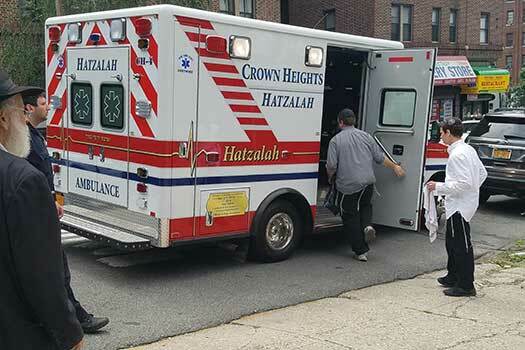 A Hatzalah volunteer identified himself to police and attempted to approach the victim in order to administer first aid, but he was yelled at by an officer and ultimately refused permission to treat the victim. 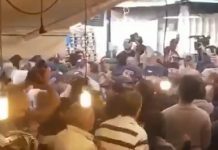 Officers kept chasing away any Jewish bystanders, even threatening some with arrest if they did not leave, all while allowing non-Jewish bystanders to remain with the attacker. Some thirty minutes later, police took the suspect to the 71st precinct, but as of publication he has still not been charged with a crime. Police say that they are still investigating. Update: Police say that a 14-year-old suspect is currently in custody and hate crimes task force is investigating. Charges are currently pending. 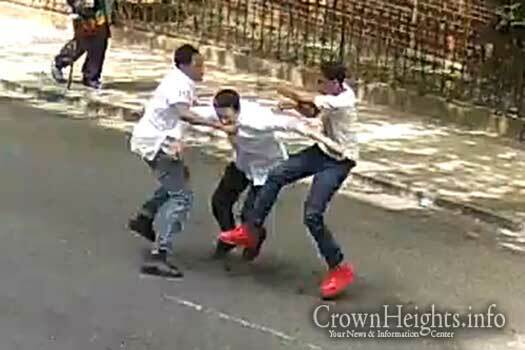 Two Black teenager beat and pummel a Jewish student. The victim speaking with police. there were at least 15 kids there. why didnt they defend each other? These donuts eaters are incompetent to enforce the law. They are only trained to give parking tickets. But not to worry. These pictures make me sick. A single thug not scared of a crowd of Jewish boys. If you’re going to stay in that neighborhood you better learn to defend themselves. 20 against 2 shame shame, they should have given them sucha beating they would never come back, we’re weak. Why continue living there? There are several large upstate cities that have more than enough room why insist on living there? Upstate has a better understanding of the 2nd amendment than the NYC liberals. Its time to learn how to defend oneself in ANY neighborhood. #2, I dont know what rock you are living under but in my world Israel is not exactly safe for Jews at all. People getting stabbed, shootings at Restaurants, killings and bombings, missiles flying. How exactly is that safer than some black kids starting up with Jewsin the streets? 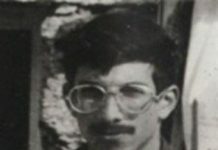 Back in the day the menahel wouldnt call the boys to go inside he would clap on the bimah and the bochurim in the bais medrash would storm out and would take care of business. Oh how times have changed.